Welcome to the updated description of Tales From Windy Meadow, a Visual Novel currently developed for Windows. You can also read about it's world and protagonists on the of website Moral Anxiety Studio. Tales From Windy Meadow is a single-player collection of interactive stories focused on a community of small village set in bittersweet fantasy world. This Visual Novel explores topics like finding your place in life, loneliness, pursuing your goals and dealing with your past and disadvantages. Our pixel art graphics are inspired by games such as VA-11 Hall-A and Kingdom: Classic, we want to create distinctive visuals and combine them with immersive, relatable writing and both guitar and piano music. To make the dialogues more dynamic, the text-based narration is mostly replaced by animations, limiting the on-screen text almost exclusively to conversations. Even though we're using Ren'Py, we added some custom features to support our storytteling as much as possible. For example, you can bring up the game's map whenever you want to visualize where the various locations are set or use your mouse to hover character names to read their descriptions. The game is in it's final stage. 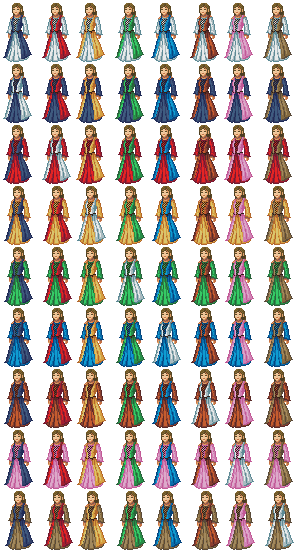 We’ve made more than half of animations, all of the backgrounds, UI, pretty much all of the coding not related to graphics. We still try to make the improve dialogues, music and sound effects, nevertheless we plan to release the game in Q4 of 2018. We have a lot of delay, though it's mostly because with time the game became much more ambitious than we originally assumed. To stay in touch with us, follow us on Twitter (@MoralAnxiety) and Facebook (@MoralAnxiety) to make sure you won’t miss any updates! Thanks! I'll try and download it sometime next week - I'm without much internet for the next couple of days! Well hello there! We made a huge progress lately and I would love to share with you newest concept arts from Tales From Windy Meadow, our incoming Visual Novel. A) One of the in-game areas, a part of the village's domesticated forest. The wilderness in our fantasy setting is a hostile space filled with threats. Because of this, even basic mushroom hunting or looking for herbs is too dangerous for anyone to make a living out of it. In result, every village tries to control a part of the forest, taking care of its plants, keeping beasts away and trying to live in symbiosis. B) Meet Calor, our friendly village blacksmith. He doesn't like his job much, but he's good at it. Really good, actually. Because of his talent people from other villages can buy new tools from him without making a trip to the city, what makes Windy Meadow a fairly popular place. However, we can't decide which beard do we like the most... Which one is your favorite? 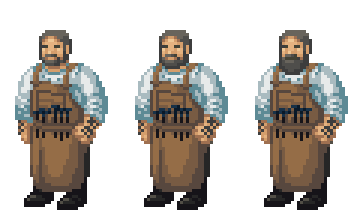 I definitely think the rightmost, with the big beard - he's a small-village blacksmith, I'm guessing he doesn't have a lot of time or money to keep it neatly trimmed! he's a small-village blacksmith, I'm guessing he doesn't have a lot of time or money to keep it neatly trimmed! Actually, blacksmiths in medieval times were quite wealthy! They were an important and valued part of their communities and there is a good reason why so many languages in Europe have various smith-related popular surnames like Smith, Schmidt or Kowalski. You can see a list here! Yes, blacksmiths were wealthy in a village context, but professional barbers wouldn't have been a common sight out in the villages nonetheless and good razors/scissors for shorter trims might have been a pain to get hold of reliably; excepting clergy, in medieval western Europe big beards were a bit of a status symbol anyway (there are some great parts in the original medieval tales of El Cid where they go into whole passages of insulting each others' beards because it's a grievous insult). Owning a better set of clothes and buying better food would probably have been rather higher on a village smith's list than buying a decent razor, I'd guess. Well, in the sense that it's a piece of metalwork, but making a really keen, fine blade or a pair of beard scissors is a rather different skillset to fixing spade-tips and fitting horseshoes! In any case, the point about beard size stands (of course, you can make whatever beard fashion you want the 'fashionable type' in fantasy lore - it might be a nice nod to give a certain style to the blacksmith which is then seen as more common in the city, as a nod to him having more money & thus trying for a slightly more cosmopolitan style). 1) The majority of our spectators, especially from Poland, asked us to keep Calor with the longest beard possible. Just remember that we have to stay reasonable - from time to time a blacksmith has to get pretty close to fire. 2) This week we wanted to introduce you Argentia. 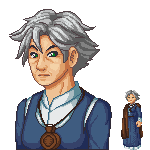 This travelling merchant doesn't live in Windy Meadow, yet she's the most trusted trader who keeps returning to our village from Berytus city. She's a young, but already respected member of the merchant guild, who puts trust in her wit and insight. And, of course - her crossbow as well. Yes, even I can definitely agree that one can go too far overboard on beards! (And that wit, insight and a crossbow sound like a good trio of things to trust in). When you guys are animating lots of characters for speech etc, do you have a standard bottom-half-of-face cycle you can reuse and repackage the rest of the face around somehow? The detail-level pixel art looks very nice. I can't really say... Because complex animations are still long way down the road. ; ) However, we won't lipsync the faces for the sake of the dialogues. We focus on the characters' emotions, so they'll work more like idle animations.